Whether it is cheering on the Jackets at the Flats on fall Saturdays or crowding Russ Chandler Stadium to watch baseball, Tech fans have plenty of opportunities to cheer on their school. One sport in which the school’s NCAA participation is notably absent is soccer. The Technique recently spoke with Christopher Uranga, publicity chair of the men’s club soccer team. He shared his thoughts on the team’s newfound success and the challenges that come with being a club team. Technique: How much of a commitment is it to be on the club soccer team? Uranga: There are usually three practices a week and one or two games each weekend. Some players even play for both the ‘A’ team and the ‘B’ team, so you could have two or three games per weekend. Overall, more than half of the week is spent with the club. Technique: What is the time and location for practice on a typical week? Uranga: They are usually held on Mondays, Tuesdays and Thursdays at the turf fields next to the CRC. But sometimes, because there are a lot of events going on there with intramurals and other club teams, we will have to move our practices indoors in the CRC. Technique: How are tryouts structured and what’s the process by which the players are evaluated and selected for the different competitive teams? Uranga: We have a tryout at the beginning of each semester. Typically the ‘A’ team has the best players and the ‘B’ team has the next best players, but sometimes a player who cannot commit as much time to the team is put on the ‘B’ team, even if he is one of the best players in the club. Technique: Coming into this year, what did the team hope to accomplish? Uranga: Looking back at the records from the last few years, we were not competing at a high level. The difference for this year is that we brought in [Bruce Wade], who is a certified national coach. He has coached at Olympic programs and other levels. So with him being there and organizing the team we were able to qualify for the regional tournament in the fall, which we have not done in over four years. Coming into this spring season off the success from the fall, our mindset was completely different … now the goal is to win regionals and qualify for nationals. We finished 10-2-2, and both of those losses were by just one goal. One of those losses came in the final of the Florida State Invitational tournament, meaning we came in second place in the tournament against some of the best teams in the southeast region. Going into the future … we want to be consistently making regionals and hopefully going to nationals and competing for the national championship. Technique: How is the competitive season structured? Uranga: Regionals are in the fall. The spring is really just for preparation for the fall and picking players for the ‘A’ team. Usually the younger guys that will be returning in the fall get picked up in the spring while the guys who are graduating will be on the ‘B’ team, since they won’t be there in the fall. Technique: Describe the team’s leadership. Uranga: We have a lot of older guys that have been with the club for a few years and have gone through the process of becoming a good team. Since they have seen the change, they are able to change the mindset of the younger guys who may have only ever experienced success. The leaders can help the younger guys stay focused and make sure we reach our goals. Technique: How would you describe your team’s style of play? Uranga: The team is very strong technically. We have very good technique and very good skills. Once we figured out which players are best fit for which positions and how to play as a team, it just came naturally since the skill was already there. We have played other teams with stronger physical aspects but they were not as technically good as us, and that has helped us overcome a lot of those teams. We also have a lot of depth on the team. Technique: What do teams have to prepare for the most when they are about to play you? Uranga: They will just have to be ready to be patient, since we possess the ball a lot. There have been other teams that have challenged us in that area, and we have been able to adjust to a new style to beat them. At any moment we can change the way that we are playing: we could be playing possessive, but if it’s not working we could suddenly switch to counter-attack, and the other team has to be ready to adjust. Technique: Does having a dedicated coach help you better implement these strategies? Uranga: He is actually only with us for the fall since he coaches high school in the spring. In the fall a lot of that came from the coach, but in the spring it almost became natural to the players since we had been used to it. 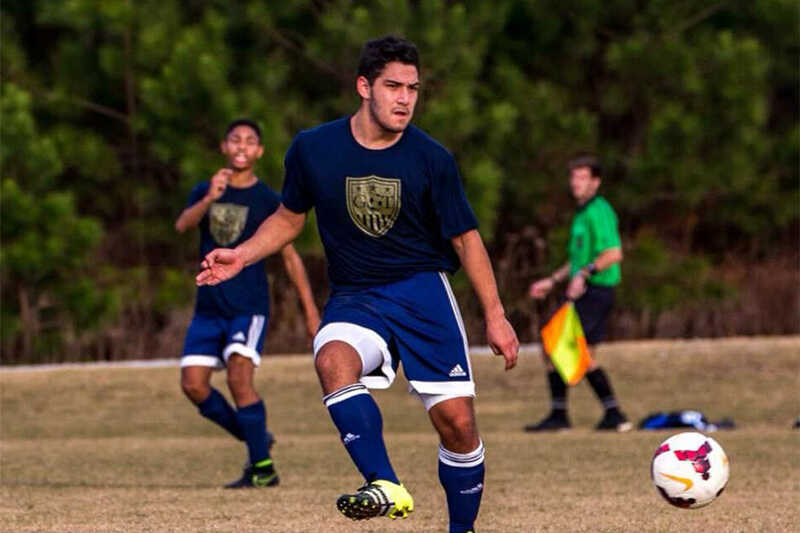 Our captain and club president [Sommy Khalaj] went to the same high school that the coach works for, so he is very used to that coaching style and can keep the same mentality and tactical awareness with the team. Technique: Do you think Tech’s student body is ready for a varsity soccer team? Uranga: I think that we are. I think that we would have a very competitive Division I team and that this would be a very attractive school for players all around the world because of our academics. There are some players on our club team that had scholarship offers at other schools but came here instead to study engineering. Technique: What are some of the challenges that come with being a club team, as opposed to competing in the ACC? Uranga: We don’t get any special treatment. We are basically competing with other club teams just for space on the field. We also have to pick times for practices based on schedules, and not every single player can be there every time, so we are limited in how much we can grow as a team. Also, only some of our money comes from SGA, while the rest needs to be provided by the members themselves. If we’re short on dues we have to cut back on equipment. Technique: If you could say one thing to the student body about your club, what do you think they should know about Tech soccer? Uranga: We have a very dedicated membership. We’re ready to compete to be one of the best teams in the nation, and we appreciate all the support we can get.